CHAPEL HILL, NC–Acknowledging that it can be difficult for undergraduates to form one-on-one connections with their professors at a large research university, a report issued this week by UNC’s Center for Faculty Excellence confirmed that piggyback rides are still the best way for students and professors to get to know each other. “Supportive relationships are essential to doing well in college, but for many students, forming those relationships with faculty can feel overwhelming,” said Eric Muller, Director of the CFE, who co-authored the report. “But whether you want to communicate your academic interests, get help with tricky course material, or find ways to do undergraduate research, our study shows there’s still no better way than to hop on a professor’s back, loop your knees over their arms, and ride them around the quad for half an hour. “A lot of students feel intimidated by the prospect of emailing a professor to schedule a piggyback ride,” he added, “but when we talk to professors, they say they really value that time with undergrads. They wonder why, week after week, no one shows up to their scheduled piggyback ride time. At least not until midterms roll around, that is! 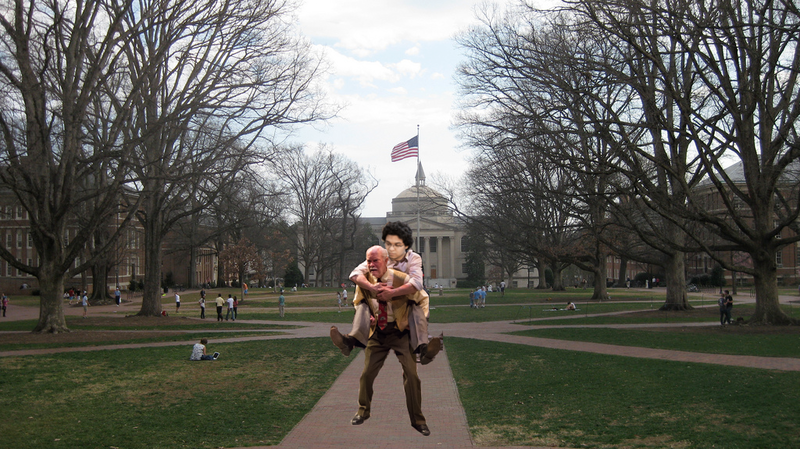 Junior chemistry major Brian Martree said piggyback rides have been essential to his academic progress at UNC. “Until last year, I didn’t think I needed a professor to lug me around like that,” he said. “But then Professor [James] Jorgenson made me come see him for a piggyback ride after I got a bad grade on a test in his analytical chemistry class. “As I climbed up onto his back, I could tell he was upset,” Martree continued, “but over the course of the ride he made it clear he was more concerned than anything. By the time he set me down, I knew he really believed I could do better. “I started going in for piggyback rides every couple weeks or so after that, talking directly into his left ear about my problems, and very quickly things turned around in his class,” Martree said. “Now I’m doing research in his lab, and he’s writing me a letter of recommendation for research fellowships this summer. “I just call him James now,” he said. Though Martree’s experience and the report show what piggyback rides can do for students, many say the system is not perfect. Others complained that they had tried to initiate piggyback rides after class and been rebuffed. “I waited in line to talk to my professor and tried to very casually transition into a piggyback ride as we walked out of class together,” said Kim Foster, sophomore biology major. “It just did not work. “I sort of landed on the floor beside him, and I tried to play it cool, but our relationship was ruined after that,” she added. The authors of the report say that such instances are regrettable, and that they hope faculty can learn from the welcoming, constructive approach that some professors take to piggyback rides. They pointed to faculty, such as Bill Ferris, the Joel R. Williamson Eminent Professor of History, whom they said should be emulated. Ferris, who was red-faced and slightly out of breath, having just returned from a piggyback ride through the Arboretum with a student who had questions about graduate school applications, said piggyback rides are essential to professors, too. “I try to make plenty of piggyback rides available to students and really listen to what they have to say while they’re back there,” Ferris said. “Most students have great ideas and interests they’re passionate about, and with a little support, it’s amazing to see what they can accomplish. “Sometimes I feel like they’re the ones who should be giving me piggyback rides, not the other way around,” he joked. Asked if he had any more to add, Ferris extended his hand and said there was only one way to really see what piggyback rides are all about.